If you’ve notified your landlord about your heating issues and the problem hasn’t been fixed, it’s time to take action! 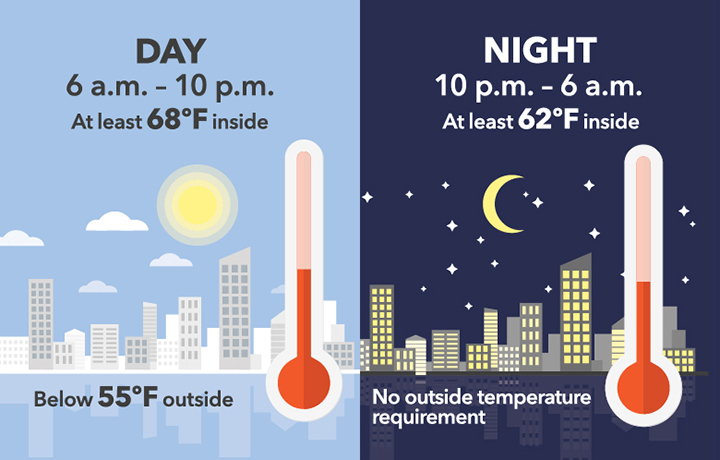 Notify 311 every time the temperature in your apartment falls below the legal limit. Every time you notify 311, you’re creating a public record of the issues you need addressed. You can make complaints about issues that are specific to your apartment, or anonymously by submitting building-wide complaints. Or download the 311 mobile app for Apple or Android. Now is a good time to talk to your neighbors. See if they are experiencing similar problems and if so, encourage them to call 311 regularly. If your building doesn’t already have a Tenant Association, ask them if they’d be willing to help you start one. After your Heat Seek sensor has been installed for at least 2 weeks, send your landlord a letter outlining the problem with your heat and providing evidence that the temperature in your apartment is too cold. You’ll want to send this letter via certified mail from your local post office. Use this TEMPLATE as a cover letter, and include a copy of your heat log downloaded from your Heat Seek account. If you don’t know the name or address of your landlord, you can look it up at Who Owns What, operated by our friends at JustFix.nyc. If you do not receive an adequate response within 2 weeks of sending the first letter, use this TEMPLATE to send a secondary letter. Again, send via certified mail and don’t forget to include an updated heat log from your Heat Seek account! Call for backup! If you haven’t reached out to your local neighborhood housing organization yet, now’s the time. If you’re not sure who provides services in your neighborhood, search the Tenant Assistance Directory at JustFix.nyc. You’ll find grassroots organizers, elected officials, legal service providers, and housing advocates who can help. Escalate your concerns. Follow the steps outlined in the Heat Seek TENANT GUIDE﻿. If you are working with a tenant organizer or legal service provider, be sure to talk to them about your plans before beginning any of the activities outlined in this guide.